On Wednesday the 3rd of September the Catholic Parliamentary Liaison Office, in collaboration with the Scalabrini Institute for Human Mobility in Africa, held a Round Table on a regional approach to asylum. The first speaker was Luca Marin, of the Centre for the Study of International Migration in Paris. The second speaker was Christopher Nshimbi of the Centre for the Study of Governance Innovation at the University of Pretoria, and the third speaker was Roni Amit of the University of the Witwatersrand’s African Centre for Migration Study. Father Peter-John Paul, director of the CPLO, moderated the discussion. In attendance were delegates from academia, civil society organizations that focus on migration, and Parliamentary researchers. 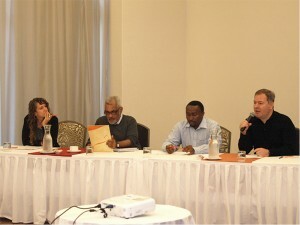 Above: Luca Marin (far right) makes a point while Christopher Nshimbi (right) and Peter-John Pearson (left) and Roni Amit (far left) listen. 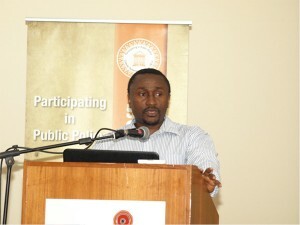 Above: Christopher Nshimbi of the University of Pretoria’s Centre for the Study of Innovation addresses the Round Table Discussion.